Munster team to face Toulon. Great to see Zeebs and Conway in the team. Keatley has not been in good form but with Murray at 9, he will hopefully improve Keatley's game. Munster: S Zebo; A Conway, S Arnold, R Scannell, A Wootton; I Keatley, C Murray; D Kilcoyne, R Marshall, S Archer; J Kleyn, B Holland; P O'Mahony (capt), J O'Donoghue, CJ Stander. Replacements: N Scannell, J Cronin, J Ryan, G Grobler, R Copeland, J Hart, JJ Hanrahan, D Sweetnam. Nice bit on Zebo in the build up. Playing his last game for Munster at Thomond? He will be back in a season or two. Very lucky that for Zebo and Munster, could have (probably should have) been a PT and YC. Zebo was never going to catch that and the ball was only going to go out off him. Terrible call by “The World’s best referee”. There’s no way Zebo can get that with his one hand like that. Zebo is goosed, don't think he will be on for long now. Toulon are destroying Munster at the breakdown. They are really playing well. Zeebs off, in absolute bits. Try for Murray after a long deliberation. Not too sure about it myself and Toulon must be feeling hard done by. Still, very clever play by Murray. Hard to make much sense of that try. Well half time Munster 10 - 6 Toulon. Toulon better in every aspect except the line out and box kicking. If I were a Toulon fan I am pretty sure I would be very upset at a few decisions going against them. Wind with Munster in the second half now though. Toulon really turning it on now and Munster look very gassed. Worrying times for Munster. Should be a pen there to toulon anyway. Flying wedge. What a finish that is! Well thank God for that. Brilliant stuff Munster, thanks for that nerve shredding, loved it! Pete330v2 wrote: Well thank God for that. Brilliant stuff Munster, thanks for that nerve shredding, loved it! Massive shout to POM who was again simply a monster in the line out and around the ground. What a special club Munster is, another brilliant European game. LeinsterFan4life wrote: What a special club Munster is, another brilliant European game. I really would’ve preferred Munster to win over Toulon at first, but the way they have been aided by the World’s best ref isn’t great. I kind of wish they’d won by more than the 7 Toulon would’ve had for the penalty try, but they haven’t. Then there’s a blatant disregard for a back foot at the end, which should’ve given Toulon a shot for the win. Just watching the match on replay - how did nobody spot the massive offside from the hack through in the phase before the line-out that ultimately lead to Munster's first try? I was thinking I must have imagined is as nobody even mentioned it but it looked very clear and obvious to me - 13 hacks through, 22 clearly four yards in front. I have to say if I were a Toulon fan I'd be well and truly unimpressed with Mr O and his team. We'll certainly need a bit of luck! Great game. What a try to win it. RiscaGame wrote: I really would’ve preferred Munster to win over Toulon at first, but the way they have been aided by the World’s best ref isn’t great. I kind of wish they’d won by more than the 7 Toulon would’ve had for the penalty try, but they haven’t. Then there’s a blatant disregard for a back foot at the end, which should’ve given Toulon a shot for the win. I'd prefer Munster over Toulon every day of the week and twice on Sunday but it does leave a bit of a bad taste when you look at some of the decisions and non-decisions made by the officials today as it did seem Toulon were hard done by on multiple occasions (and I find it really hard to feel sorry for that team for some reason) - I think Nigel's crown may be slipping a bit. I think that Owens got the first decision wrong (should have been a PT and a YC for Zebo) but the Murray try was absolutely spot on. Sweetnam also did not knock on and if the play went on and to the TMO I think the Munster try would have stood. It kind of evened itself out in the end but I did feel that Owen's was very critical of Toulon in the first half. I'd agree with most of that Billy but the Murray try came from a position which they never should have been in as there was a clear offside missed a couple of phases previously which would have put Toulon back in the Munster half. I think it's on about 26 mins - couldn't be clearer and I was baffled how nobody saw it as when someone hacks through the first thing you look for is offside and 23 (Sweetnam?) was about 4 yards in front of the kicker. As mentioned I'd rather have Munster over Toulon, but the officials missed some really basic stuff which had a big influence IMO. The biggest talking point is always going to be the non penalty try, when a team loses by less than 7 sadly. The refereeing in all the Champions QFs has been poor so far this weekend. Unless all the others were off on Easter holidays, I've no idea why probably the two worst English officals were put forward for the match yesterday (Maxwell-Keys was shoddy the week before for the Tigers v Wasps match as well). Both games I’ve seen (Scarlets and today) has seen the refs being a bit of a homer. Not really seen Pearce to know whether it’s a trend, but there’s always the talk of Nigel being lax towards Irish teams, that won’t go away after today. It was a weird game. First Toulon looked very dominant and in control, then Munster looked in control, then Toulon only for Conway's try out of nothing. RiscaGame wrote: Both games I’ve seen (Scarlets and today) has seen the refs being a bit of a homer. Not really seen Pearce to know whether it’s a trend, but there’s always the talk of Nigel being lax towards Irish teams, that won’t go away after today. Yeah when people are hoping for Irish teams to be beaten then they tend to have biased opinions. Nigel is a homer, like in the Stade de France for the France Ireland match. Nige cemented his place as after dinner speaker at the Munster awards then ? Trinh Duc should be banned from European rugby. Missing the touch line twice (if you include the game for France against Wales) is really so unprofessional, he should be fined. Lack of precision during the 1H is really what cost Toulon in the end, not the ref. The home referering is part of day to day life of French travelling teams anyway so not really an excuse, just natural handicap in rugby world. Heaf wrote: I'd agree with most of that Billy but the Murray try came from a position which they never should have been in as there was a clear offside missed a couple of phases previously which would have put Toulon back in the Munster half. I think it's on about 26 mins - couldn't be clearer and I was baffled how nobody saw it as when someone hacks through the first thing you look for is offside and 23 (Sweetnam?) was about 4 yards in front of the kicker. 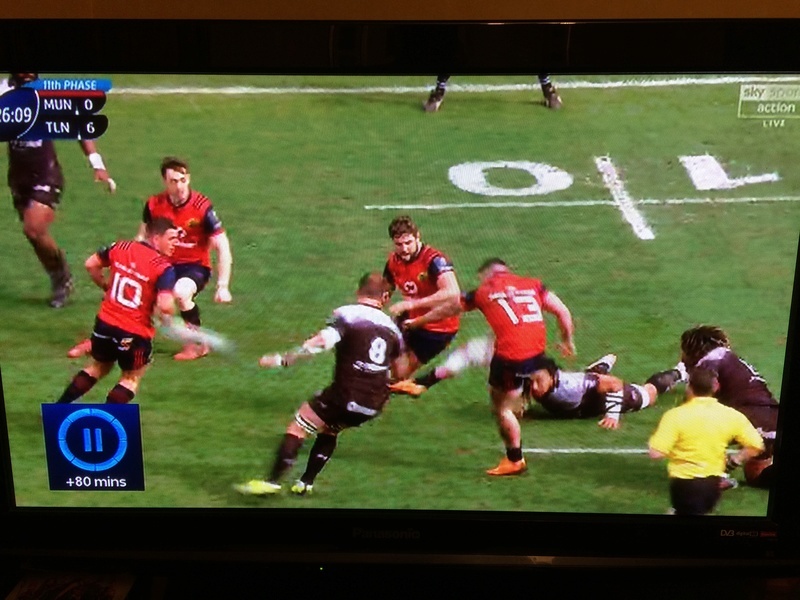 Sorry don't mean to go on about this but I'm puzzled how the 'best ref in the world' can be looking right at this and still not spot the obvious offside unless they changed the laws without me knowing about it ... Sweetnam from yards in front chased down the kick and made the tackle forcing Toulon to kick to touch - Munster then scored from the resulting line-out. From where the pen should have been given Toulon could have even gone for the posts to go 9-0 up instead of 7-6 down. As mentioned I wanted Munster to win but this looks so clear and obvious that it's bugging me as I still can't work out how nobody else seems to have spotted this as it's not even marginal so I'm wondering if I'm missing something? Well err everyone forgetting Nige blowing up for a knock on when Sweetnam clearly knocked the ball backwards leading to Wootens non try!! Swings and roundabouts all day from nige. Toulon got every call st the breakdown which was correct but in the last twenty when Munster weee doing the same he gave us nothing. He missed a clear forward pass as well. So there you go. Here's where World Rugby have made a rod for their own back by commenting publicly on the disallowed try in the England-Wales match, among others. Owens ruling that Zebo had done nothing wrong is just as controversial, and warrants similar clarification of the laws for future incidents. I'd rather we got no post-match clarifications but, if there are going to be some, then it would be good to know in what circumstances we can expect them. I was largely neutral on those Champions Cup fixtures but probably leaning towards Scarlets & Munster. I'm pleased for both winning sides but I can't help feeling the two French sides were hard done-by. Don't get me wrong, I'm enough of a hypocrite not to care one jot if a team I supported strongly got the benefit of those decisions. Geen sport voor watjes wrote: He missed a clear forward pass as well. So there you go. If you mean the one for the Toulon try he didn't miss it - they looked at it and judged it flat - whether that was the correct call is another matter. But once again as I said my point was that offside looked so clear and obvious I can't understand how nobody at all commented on it (Mr O was inline and feet away, the AR was also close, the commentary team didn't say anything), which genuinely left me thinking had I missed something? Why are you getting so caught up with this offside thing? From the picture you posted, it doesn't look as obvious as you're making out... it was missed by the officials, it happens. I'm sure Toulon had their fair share of decisions go their way when they won 3 in a row. At the end of the day if Trin Duc puts the ball out of play they win the game, that's all its down to. What a result by the men of Munster. Amazing. I'm not disputing the result - and to be clear again, I'm more than happy to see Toulon lose any time and people don't need to keep 'defending' Munster's win. I've watched the moment Heaf is referring to and it is actually a blatant offside - the freeze frame above doesn't actually do justice to how obvious it is. Really strange that the officials missed it. Well, its looking like Racing will be Munster's semi final opponent now. There it is, Racing v Munster semi final. It was a close game until Carter came on and stole the show with a wonderful 20mins. With a bit of luck, Leinster will also make it to the semi finals at the cost of Saracens soon. OK whatever ... I really don't care what people like you that have to resort to insults for no reason think. Wayne Barnes was probably the worst ref of the weekend in the end which is quite a feat. ASM supporters feeling rightly robbed while a dominated Racing team somehow find its way to the SF. Expect to see way more Munster supporters in Bordeaux than Racing ones.